Vertical sliding sash windows. Elegance, aesthetics, efficiency. 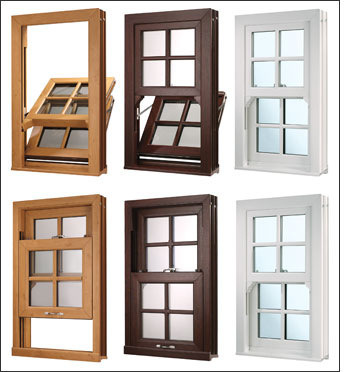 Home > News > Vertical Sliding Sash Windows. Elegance, Aesthetics, Efficiency. The vertically opening sash window is perhaps the most enduring and popular of all window designs. Invented some 400 years ago and installed in every home from royal palaces to humble country cottages as a matter of course until the 1900s, it’s a perfect combination of ingenious engineering and immense practicality. Its heyday was in the Georgian and Victorian eras, when a rapidly growing merchant class looked to the ‘perfect canons’ of classical proportion in the grand terraces they commissioned to celebrate their wealth and status. Even now, architects designing premium new homes will often incorporate windows in the traditional sash style when they want to impart a little period grandeur in their creations. All the looks and style of the sash, without the drawbacks. The problem with most of the original sash windows that are still around today is that their age has long since started to tell, and If you’ve ever lived in a home with draughty, rattling sashes, you’ll know how noisy and irksome they can be. Just like the sash windows of old, our vertical sliding windows - or VS windows for short - feature top and bottom casements that you can slide open and position however you want. In the days before central heating and air conditioning, this was a highly effective way of regulating temperature and ensuring a flow of fresh air through the house. It’s simple physics really; warm air rises and flows out of the gap between the top sash and the window frame, while cooler air is drawn in through the opening at the bottom. That’s thanks to a combination of innovative brush seals, a triple chambered UPVC frame profile and the option of 24mm low ‘E’ glazing, which together make up a window that scores a straight ‘A+’ for energy saving, with U-Values as low as 1.3. Precision engineered for easier operation. Today’s computerised designs and precision fabrication systems mean your sash windows will slide open effortlessly, and stay exactly where you put them. This easy opening also provides a means of escape from fire, as demanded by Part B of the Building Regulations for homes. Every Eurocell sliding sash window is an original, fabricated to the precise dimensions of each window frame. You can have a window made to any size up to a whopping 1.6m x 2.4m and choose from a wide range of colours, finishes and accessories to match it to the style of your home. Colours include classic high gloss White, Cream Woodgrain (perfect for a country cottage style sash), elegant Rosewood, Golden Oak and more. 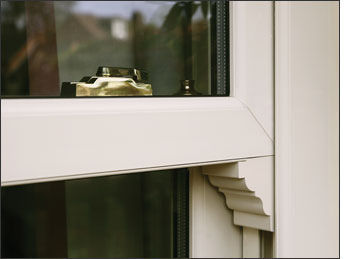 Further options include specification details like decorative horns, sculpted Georgian bars and period style brass effect latches, handles and locks to give your new UPVC sash windows an even more authentic look and feel. Keeping more undesirable elements out. As well as banishing cold and draughts from your home, Eurocell vertical opening windows also keep unwanted visitors in the shape of opportunist burglars at bay. Security is never far from any homeowner’s mind, and with the range of enhanced security features built into our vertical sliding window range, you can rest easy knowing intruders will be frustrated in their efforts however hard they try. A strong, aluminium anti-jemmy bar is included as standard. This stops windows being levered open - one of the most common forms of breaking and entering - and prevents the window frame from bending and snapping. You can also ask for additional high security locks and hardware when your installer visits to survey the job, giving you even more peace of mind. As well as helping you cut down on your carbon footprint - not to mention your fuel bills - Eurocell sash windows can make you feel good about your contribution to the environment in other ways too. UPVC is one of the most sustainable materials you can choose when it comes to windows. Or anything else, for that matter. That’s because it can be recycled and used again and again with no loss in quality or performance. In fact, most of the UPVC products we manufacture contain post-consumer plastics recovered at our state of the art recycling plant in Derbyshire. Making Eurocell VS windows some the most environmentally friendly you can fit in your home.